Atticus Claw, the world's greatest cat burglar, has received a mysterious message about a new job. He has been asked to go to a secret meeting in a seaside town, Littleton-on-Sea. Atticus is curious and decides to go, but when he gets there, he realises he will be working for a criminal magpie gang. The gang want Atticus to steal all the jewels in the town. Atticus starts to make himself at home in Littleton-on-Sea with the Cheddar family. He becomes fond of them, and then somehow, a life of crime does not seem so attractive any more. Atticus also starts to wonder what the gang's motives are for wanting him to steal so much jewellery. He realises that they are not telling him everything. Can he stop the magpie gang from ruining everything for the Cheddar family, and can he stop the gang from double-crossing him and getting him into terrible trouble? 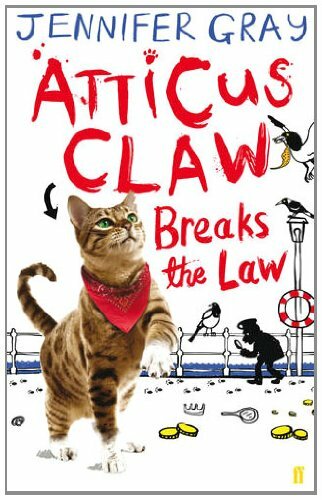 Atticus Claw Breaks the Law, is the first title in the ‘Atticus Claw’ series. It is a fun and enjoyable animal adventure for children.